At its September 10, 2013 meeting, Community Services Committee (now Citizen Services Committee) passed the For the Love of Winter: WinterCity Strategy Implementation Plan. At an in-depth, facilitated workshop, members of the Advisory Council and working groups, as well as invited community members, met to prioritize the actions in the Implementation Plan. Actions were divided into the categories of foundational, quick-win and determined effort, and timeline targets were set for short-term (1-2 years), medium-term (3-5 years) and long-term (6-10 years). Descriptions of all the actions and their categories can be found in the Implementation Plan. The WinterCity Advisory Council was formed to oversee the development of the WinterCity Strategy Implementation Plan. Four working groups were also formed to work on each of the four pillars: Winter Life, Winter Design, Winter Economy and Winter Story. The Advisory Council and the working groups were made up of community members, City of Edmonton employees and two City councillors. The For the Love of Winter: Strategy for Transforming Edmonton into a World-Leading Winter City was enthusiastically endorsed by City Council. The WinterCity Think Tank’s recommendations were reviewed at the May 14, 2012, Goal Validation Workshop, and then by all Branches within the City’s Departments. We collected all this feedback and fine tuned the proposed goals and actions. At the July 6, 2012, Think Tank meeting, the Think Tank approved the goals and actions that form the backbone of the strategy. At the August 30, 2012, meeting they then approved the rest of the text of the strategy document. From March through May 2012, the project team consulted with almost 200 individuals. We held leadership sessions and dialogue workshops with key stakeholders from these diverse groups. In addition to the above, presentations were made to twelve groups including a City Hall School class, Wichitowin, M.A.D.E., the Community Services Advisory Board (Now Citizen Services Advisory Board), and NextGen. In addition to all the people reached through the above efforts, others participated through IdeaScale (our online crowdsourcing tool), the postcard campaign, and the Global TV Winter Life Contest. Through these methods, we collected almost 500 ideas – rich, creative, diverse… All together giving a very good idea of where this strategy needs to take us. It is intended that the recommendations would build on these assets. Also, all the draft recommendations will be considered through the lens of the Guiding Principles. The Think Tank presented their draft recommendations at the April 25, 2012, Think Tank Meeting, and then 83 people attended a Recommendation Workshop on May 14, 2012 to review them and make suggestions for improvement. 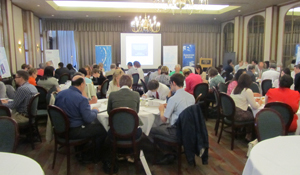 On May 14th, 83 people turned out to the Petroleum Club for a four-hour workshop to review and validate work done so far by the WinterCity Strategy Think Tank. The Think Tank had developed 14 recommendations, each followed by a number of actions. Participants discussed each recommendation and all the actions. 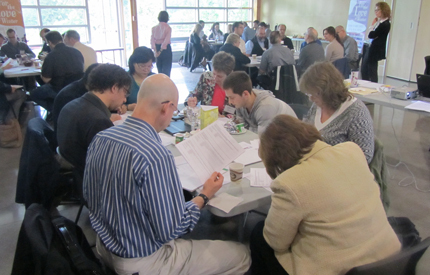 They were asked if they agreed or disagreed with the material, why and what suggestions they had for improvement. Their work is now being integrated into draft 2 of the WinterCity recommendations, which will go back to the Think Tank chairs for further refinement. How do you develop the world’s largest outdoor winter party and repeatedly attract crowds throughout the winter months? On February 14, Edmontonians gathered in City Hall to hear Pierre Labrie, former head of Quebec City Tourism, answer these questions. He spoke of Quebec City’s journey to becoming a winter city success story - a destination for residents, Quebecers and international tourists. 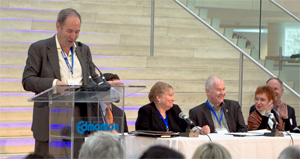 On January 20, 2012, 170 Edmontonians gathered at City Hall for a half-day symposium to learn about Edmonton’s WinterCity Strategy development and provide their input into the initiative. First, they were welcomed by City Councillor Ben Henderson – with a slide show of his fact-finding trip to several successful winter cities in Scandinavia. Next, Edmontonian and NextGen member Carol Neuman wrapped up all the great things already happening in our city during the winter. Then the real work began. People gathered in small groups to give their ideas and recommendations for the WinterCity Think Tank. What better way to celebrate winter than with a winter party? 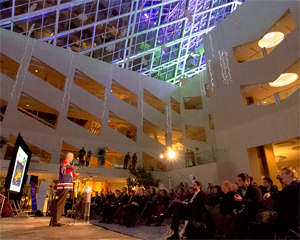 Hundreds of Edmontonians gathered at City Hall on the evening of January 19, to celebrate and help kick off the development of Edmonton’s WinterCity Strategy. They shared their ideas for what would make Edmonton a great winter city – and took in the music, lantern making and free skate rentals. The highlight was keynote speaker John Furlong, former CEO of the Vancouver Winter Olympics. He had people laughing and he had people holding back tears. But mostly he inspired: talking of the need to believe in Edmonton’s vision of becoming a great winter city and the importance of all Edmontonians being part of the magic to make that happen. In 2011, City of Edmonton's Community Services (now Citizen Services) was charged, under the leadership of Councillor Henderson, with developing a WinterCity Strategy: to recast Edmonton as a livable winter city that gets global recognition and attention for its major winter events. As part of the research phase, Councillor Henderson and three city administrators travelled to world renowned northern cities in Finland and Norway to identify best practices of world class winter cities. Public spaces: designing city spaces that are inviting and safe, with consideration of visual and aesthetic elements for people in squares, parks and classic urban districts. Climate is considered in architecture, urban design, transportation and infrastructure planning. Buildings: use of colour, proportion, spatial quality, façade details and retail life can influence the people’s experiences in a winter city. Branding and marketing: how northern cities market and brand themselves as winter destinations. The City of Edmonton, with City Councillor Ben Henderson taking the lead, began work on this project in 2010. City Councillor Ben Henderson invited people involved in Edmonton's winter events and other community leaders to gauge interest in developing a Winter City Strategy. Need for a culture shift to embracing winter, instead of enduring it. Bring a new vision forward of Edmonton being a world-leading Winter City. Increase Edmontonian's participation in wintertime festivals, outdoor activities and programs. Attend to people's leading concerns: snow removal, traffic safety, isolation, sidewalks, etc. Take a multi-functional approach to the development of Edmonton as a winter city.